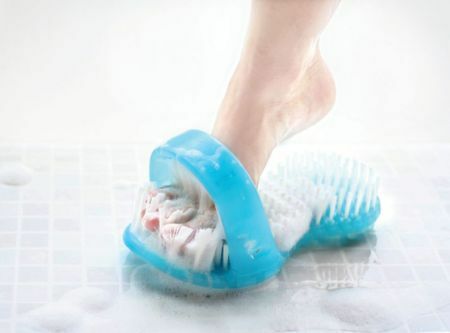 The Shower Sandal requires no bending or stretching to use. Simply affix the suction cups to the floor of the shower or bath, wet it, apply some liquid soap and rub your foot back and forth for a thorough, refreshing foot wash. The ShowerSandal is designed to clean your entire foot, including in-between toes, the arch, heel, sides and top of the foot. It is especially useful for people who have difficulty bending or those who have a condition requiring special foot care. The Shower Sandal gives a gentle massage while providing comfort and safety by alleviating the need to bend. May be cleaned in either the dishwasher or washing machine.